What follows is a tragedy. Admittedly, a minor tragedy in the scheme of things, but one that played out in front of AJ, our daughter and myself at our home in Johannesburg just after Christmas. It involves a hardworking bird called a southern masked weaver and its failed attempt to win a mate. Weaver birds, as their name suggests, weave intricate nests. They are a family of birds mostly native to sub-Saharan Africa, with some species living in tropical Asia. According to Weaver Watch, one of their number, the red-billed weaver or red-billed quelea, ‘ …is one of the most abundant bird species in the world and its post-breeding population has been estimated to be 1.5 billion birds, leading to its nickname “Africa’s feathered locust”’. Since it readily eats crops, this makes the red-billed quelea a serious threat to subsistence farmers. Most weaves, however, are harmless. They are beautiful birds, small and compact, and during mating season (September to January) the males are brightly coloured, brilliant architects and hardworking builders. Since arriving in South Africa six months ago, AJ and I have admired weavers and the intricate nests they make, and were planning to build a feeder and bird bath to attract to them to our home. Then to our surprise, on Boxing Day, AJ and daughter (visiting from Australia over Christmas) noticed a southern masked weaver starting a nest hanging from a branch about halfway up the jacaranda in our backyard. In fact, by the time we noticed its existence the nest had already been started: the first central ring of long fronds had been weaved together, and an inner lining of fern (or possibly jacaranda) leaves laced in to help make the nest more comfortable. As we watched over the next two days, the weaver worked virtually non-stop on building the new home. Its skill, agility and determination were remarkable, and the product of its labour a thing of beauty. I wouldn’t be surprised if our distant ancestors learned to weave from watching these little birds at work. When the male has finished building the nest, a female flies in to assess its suitability. While the male of the species is a brilliant architect and hardworking builder, the female is a severe critic and, occasionally, expert demolisher. If she doesn’t like the nest, she will often tear it to pieces; the male will then start again, or choose another location to build a completely new one. Three days after first noticing the nest in our jacaranda, we left home for most of the day. When we returned, the nest was gone, its ruins laying on the lawn below the tree. At the time AJ theorised it was a young male, new at the game, and a female had let it know in no uncertain terms that its efforts weren’t good enough. But then we remembered that there had been a brief but violent storm while we were out, and it seems likely this was what brought down the nest. Sadly, we didn’t end up with a happy couple residing in our backyard and raising a new brood of southern masked weavers. On the plus side, male weavers usually build a series of nests; we can only hope our male successfully found at least one female willing to put up with his efforts and share with him a clutch of eggs. 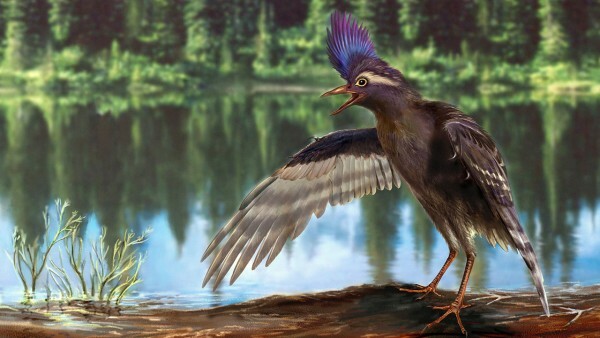 Remarkable new finds announced by China’s Institute of Vertebrate Paleontology and Paleoanthropology includes the earliest date yet established for a true bird and a bird-related dinosaur with leathery wings.